Our highly qualified and experienced dispensing staff at Silverman Opticians in London N1, provide detailed unbiased advice on bifocal spectacle lenses without obligation or pressure. 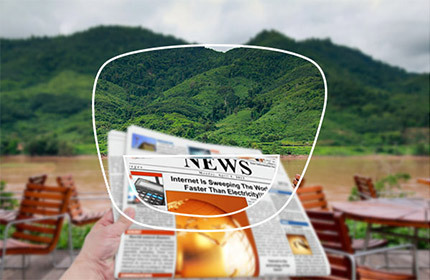 Bifocal lenses are designed to counter presbyopia, which usually begins to affect us in our forties. As our eyes mature, the nearest point that we can focus on becomes further away and so reading and other near vision activities become more difficult. Bifocals are eyeglasses with two distinct optical powers (distance at the top and reading at the bottom). Bifocals are most commonly prescribed to people with presbyopia who also require a correction for myopia, hypermetropia and/or astigmatism. Benjamin Franklin is usually credited with the creation of the first pair of bifocals in the early 1760s, though the first indication of this comes from a political cartoon printed in 1764. Up until the beginning of the 20th century, two separate lenses were cut in half and combined together in the rim of the frame. The mounting of two half lenses into a single frame led to a number of early complications and rendered such spectacles quite fragile. The latest bifocal lens designs come with a variety of segment shapes, sizes and coatings each of which provide different occupational and dispensing benefits. Bifocals are also suitable for people with extremely high spectacle prescriptions who are unable to wear varifocals. At Silverman Opticians we also provide the latest invisible bifocal or no line lenses. These are lenses with two distinct optical powers distance at the top and reading at the bottom but without the line in the middle.